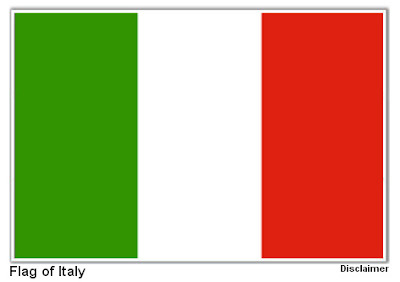 The colors of this salad come from the Italian flag: green, white and red. It's a traditional salad known in Italy as Insalata Caprese, meaning "Salad of Capri" that's made with fresh summer ingredients. My first recipe with homegrown tomatoes is always a Caprese Salad. 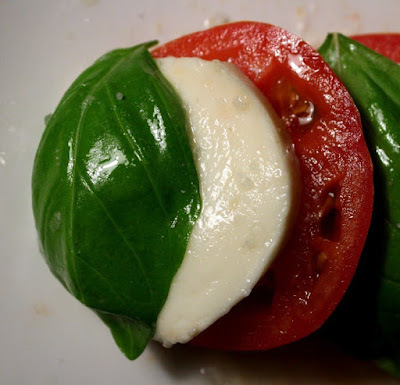 Plus it's so simple to make with just sliced tomato, mozzarella cheese, olive oil, fresh basil, and a little salt. So check out my video recipe below to see the colorful steps to build your own Caprese Salad at home. There are variations to this salad that include adding balsamic vinegar, pesto, or Italian dressing. I like the addition of fresh ground black pepper to mine. And since you are drizzling on olive oil make sure it is a tasty one. A version made with balsamic vinegar and black pepper. Of course, everything starts with a good tomato. My small crop of summer tomatoes got a late start so this is an end-of-summer dish. But if you have a weekly farmers market then do get a basket of heirloom tomatoes. It cost more, but sometimes you just gotta splurge. I have found decent tasting tomatoes at regular grocery stores, and, believe it or not, my local 99c only Stores stock small plastic bins of them every once in a while. Mozzarella is the other main ingredient. Use fresh if you can get it. 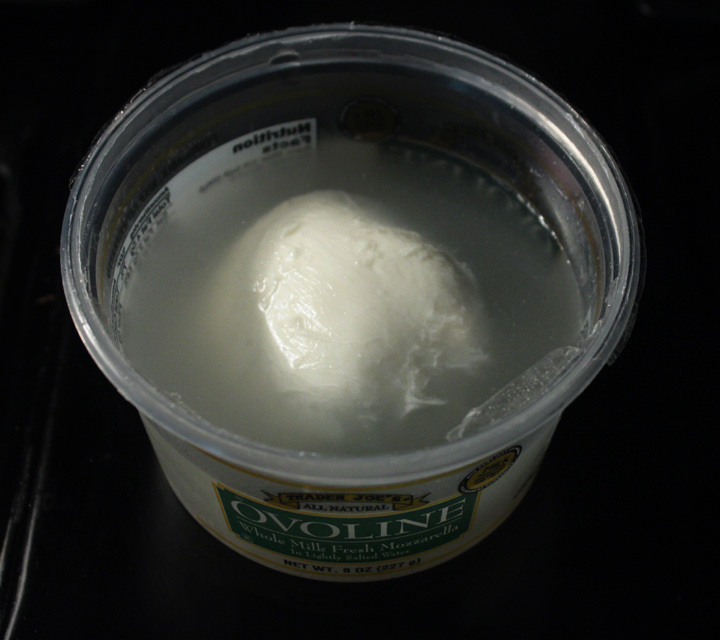 Fresh mozzarella is usually stored in a plastic bin that's filled with water. It's less salty than commonly sold mozzarella that you might shred into a typical pasta dish, or top a pizza. 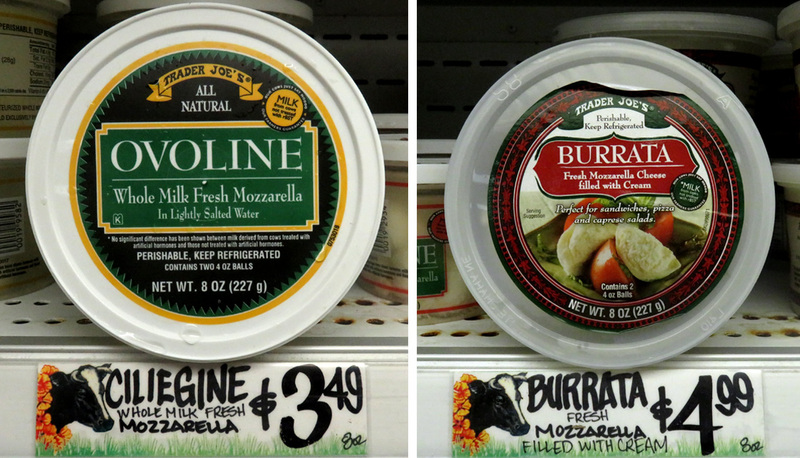 Fresh mozzarella is soft and tender with a mild taste. 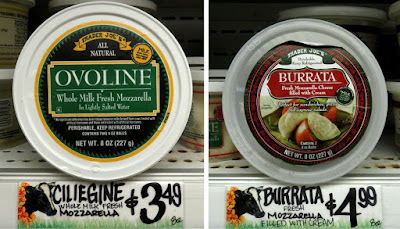 I get my fresh mozzarella from Trader Joe's grocery in Los Angeles (I wrote about them, here.) 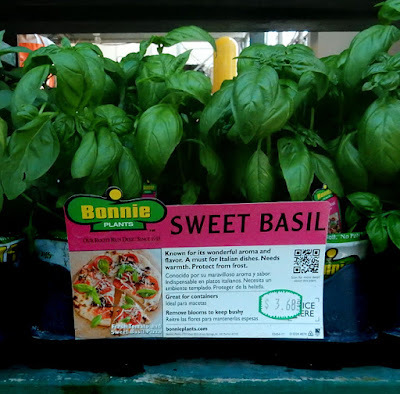 Specialty delis and some grocery stores will carry it, too. Click on any photo to see larger. 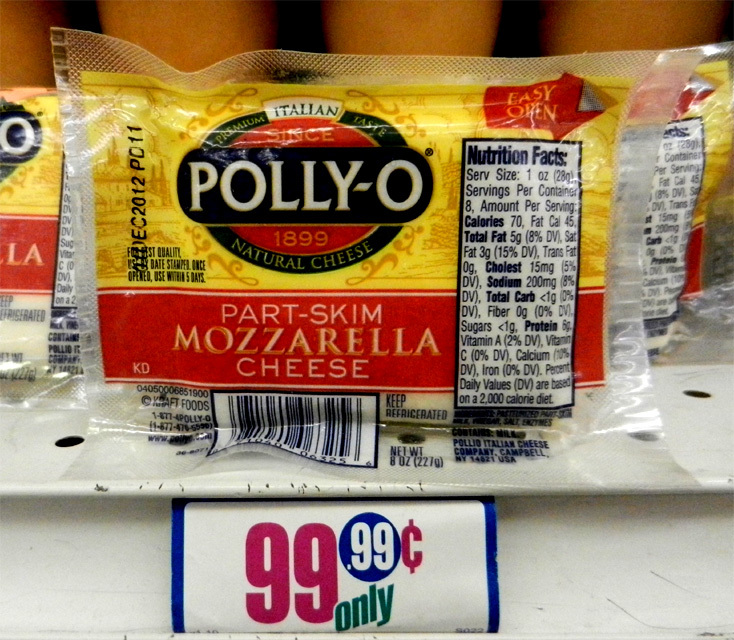 I've used mozzarella from a chain grocery cheese deli section in a pinch, even if it is a bit rubbery. Since I grow my own tomatoes, it's still a good deal...wait, who am I kidding here. 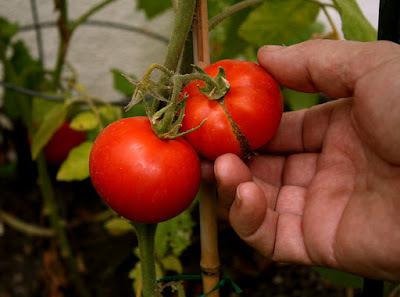 By the time you invest in buying tomato plants, watering and fertilizing, you are lucky to break even - that is, if you even get a small handful of ripe tomatoes at the end of the growing season. Oh well. Just the intense flavor of a homegrown tomato makes all the waiting worth it! Finally you want fresh leaves of the herb, basil. While pungent, you are only adding one or two leaves per tomato and mozzarella slice. I like to get a plant and pick the leaves as I need them. A plant will replenish itself, too. Also, you can find small packs of cleaned leaves in the fresh produce section of better stocked grocery stores. A drizzle of olive oil and a grind of fresh sea salt finishes it all. 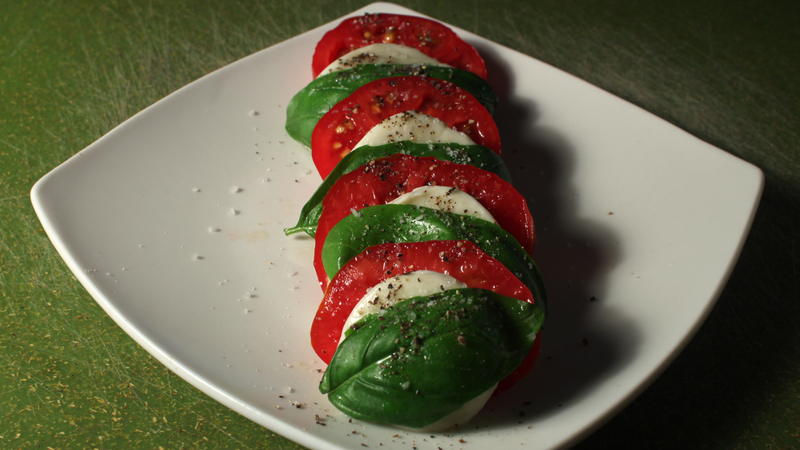 It's up to you how to present a Caprese Salad. I like to just line it all up. You can skewer it all if you are using easy-to-get cherry tomatoes. I also like to make small individual stacks. Make it like a typical salad and loosely mix it all up. Or just lay out a platter of sliced mozzarella and tomatoes, with a pile of basil leaves, and let your guest build their own. Play it here, video runs 1 minutes, 32 seconds. 3-4 tomatoes - I used medium size. I sliced the tomato thick. 6-8 ounces fresh mozzarella cheese - I had a little left over. Okay to use regular mozzarella. 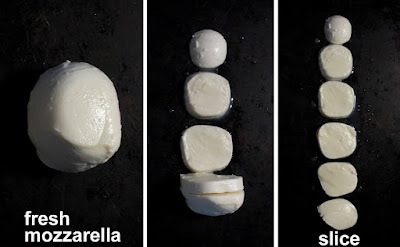 Slice the mozzarella to fit tomato slices. 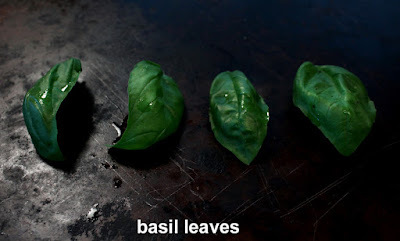 Fresh basil leaves - One or two leaves per tomato slice. Some of my leaves were quite large, so amounts will vary. Olive oil - make it a good tasting one. You need enough to drizzle over the salad. Salt to taste - sea salt is best. Optional additions: black pepper and balsamic vinegar. 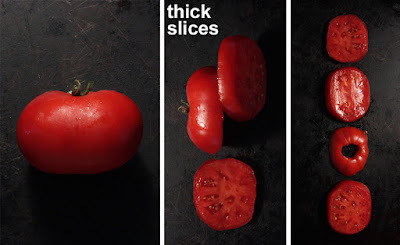 Clean and slice tomatoes. I like to slice them on the thicker side. 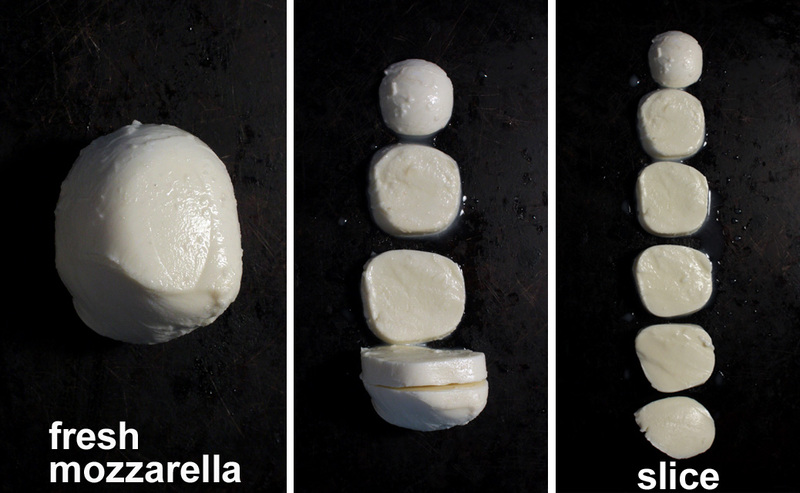 Drain and slice fresh mozzarella. 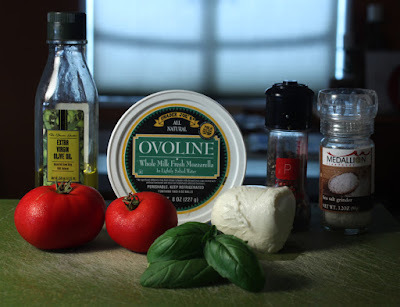 Slice mozzarella to fit tomato slices. Clean basil leaves if necessary. Pinch off the stems.Use as many leaves as you like. 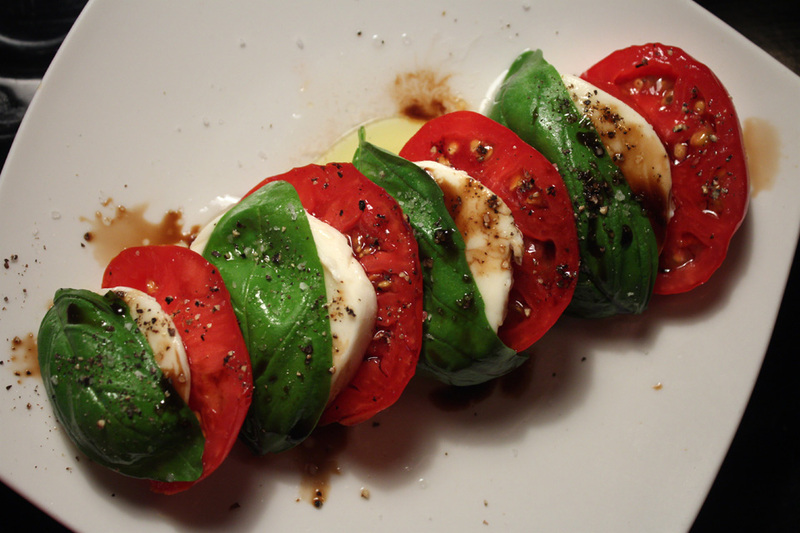 Assemble Caprese Salad any way you like. Make individual stacks, or lay it all out like you would a typical salad. I just line my slices all up, alternating tomato, basil and cheese. Finally drizzle on some olive oil and give a sprinkle of sea salt. Sometimes I like a little black pepper, too. And here's a bonus video of my vacation to Italy with Mrs. 99, done in June of 2002 - great food, good company and much fun! Play it here, video runs 19 minutes, 40 seconds. My YouTube video link for viewing, just click here.